It’s a new year and, for many, that means a new resolve to get in shape and start living a healthier lifestyle. And for a low-impact routine that packs a big punch, you can’t go wrong with swimming pool exercises. One of the common swimming pool exercises is pool walking. This is an easy and effective water activity that requires absolutely no swimming skills or equipment – just you, your pool, and maybe some music to keep you going! When performed in waist-deep water, pool walking combines the cardiovascular effort of aerobics, the toning of weight training, and the enhanced flexibility gained through yoga. Fact: Due to viscosity, drag forces and frontal resistance, water provides a resistance which is proportional to the effort exerted against it. Resistance in water ranges between 4 and 42 times greater than in air – depending on the speed of movement. This means that you will be burning more calories in the pool than on land! Water is a natural and instantly adjustable weight training machine, providing resistance in all directions to tone and strengthen the muscles. Because of this, walking in the swimming pool promotes balance in muscle development in addition to the cardiovascular benefits. Water workouts effectively burn fat and strengthen the abdominal muscles. This is the result of your body stabilizing itself while maintaining balance as it reacts to the buoyancy of the water around you. The movements are low impact and joint friendly, helping you prevent injuries as well as heal them. In water, resistance determines your intensity. You are in charge! Go at your own pace – set your own intensity level by incorporating speed, force, or surface area. Adding arm movements under the water will add to the challenge since the arms have to work to propel you through the water; by increasing speed, you increase the intensity of the workout. Walking in the swimming pool is an easy and fun exercise that can be performed at your own pace and intensity. It is a fun, simple activity that is great for almost any fitness level and those whose swimming skills may be less than par, or anyone else who wants a change-of-pace workout! We’ve gathered a few tips to help you get the most out of your pool walking workout. Switch up your speed and intensity at random intervals to get the most out of your pool walking workout. You may not be able to keep up high-intensity spurts for long, but keep working them in. This gives your heart and your muscles a better workout and studies show that this kind of interval training can stimulate your body to burn fat even after your workout! Consider wearing a baggy t-shirt or shorts to create additional drag. This will give you a better workout. Make sure you maintain an active pace that keeps your heart rate up. But if you’re not able to carry on a conversation, you may be pushing yourself too hard. Ease up a little until you feel an improvement in your breathing. Once you feel the pool walk is getting easier, it’s time to pick up the pace or bring in some extra resistance. Try incorporating water weights for an added boost to your routine. If you don’t have any water weights, just fill an empty carton of milk with water until it’s the right weight for you. Pump your arms in the water while holding these weights and walking to increase the challenge. If you are looking for a simple, yet effective exercise that’s easy on the joints and good for nearly any fitness level, then pool walking is for you. The healthier lifestyle you want could be as easy as getting in the swimming pool. That’s especially true if you have one right in your backyard. There are so many benefits to owning a pool, from fitness to fun and family memories. Contact us today to get started! 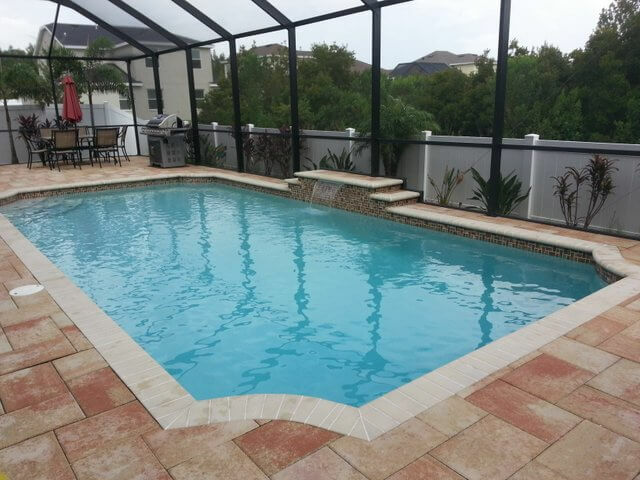 Tampa Bay Pools is a custom pool builder serving Tampa Bay, Brandon, Clearwater, and St. Petersburg areas, who understands the importance and value of your own backyard escape. That’s why we build spectacular new inground swimming pools that are easy to maintain. We offer a wide variety of custom projects including residential or commercial swimming pool building, stunning custom features to customize your pool, outdoor enclosures for your backyard oasis, and custom spas. Our pools can be designed to fit any style or budget; we even offer swimming pool financing options.